Injured journalists enter an ambulance after an attack at a pro-government protest. Photo by Twitter user @forty_tw0, used with permission. Macedonian authorities take their time processing the criminal cases of attacks on journalists, in a pattern contributing to the atmosphere of impunity and intimidation. During the previous year, dozens of cases of physical violence against journalists, arson of their cars or property, and other attempts to intimidate them went unsolved. In fact, the Association of Journalists of Macedonia published a report in April 2017 that said the main means for control of media in the country are government money and violence. At the end of January 2017, former Prime Minister Nikola Gruevski failed to persuade the ethnic Albanian parties to join his government coalition. The leader of VMRO-DPMNE, the longest-ruling Macedonian political party, then publicly called upon “the people” to take to the streets and prevent the formation of new government, which would include his erstwhile Albanian partners and the opposition Social Democratic Union of Macedonia (SDSM). “All those who plan to wait in front of the TV in their slippers, believing someone else would do their job in defending the country are sorely mistaken,” Gruevski proclaimed. The rhetoric included messages to deal with all kinds of “traitors,” which alongside political opponents and NGOs, are often understood to include independent journalists. Soon after his call, Gruevski's supporters organized a series of protests under the motto “For United Macedonia”. From the beginning, some participants verbally accosted journalists from media outlets that aren't under the influence of VMRO-DPMNE. Two A1on journalists were seriously beaten at the DPMNE protest!!! At the moment they're taking them to emergency room! The perpetrators ran away, and the only police officer who had begun to chase after them was ordered to stop by his superior officer. The Journalistic Trade Union, Association of Journalists of Macedonia, and the informal Journalist Network, consisting of over a hundred journalists from the Balkans issued condemnations, requesting speedy investigation and processing by the state authorities. Кажавме се што имавме да кажеме во однос на нападот, односно како се случи нападот. Повеќе од јасно е што се случуваше затоа што имаше фотографи колеги и снимки од камерите не Градски трговски центар. Знаеме дека е фатен и идентификуван еден од напаѓачите, а другиот бил со качулка и наводно бил со очила и затоа не можеле да ги идентификуваат. Биле на распит во полиција, пуштени се на слобода и имам информација дека едниот работи во Град Скопје. Чудно е што рочиштето трае толку долго, затоа што од инспекторот веднаш беа доставени материјали, а нас не викаат по речиси три месеци. We gave our testimonies about the attack and how it happened. It's more than clear, because there were photographs from colleagues and video recordings from the cameras of the City Shopping Center. We know that one of the attackers was caught and identified, while the other wore a hood and glasses and allegedly the police couldn't identify him. They were questioned, and allowed to go free. I received information that one of them is employed in the local government of City of Skopje. It's strange that the process is taking so long, because the inspector had submitted the evidence promptly, while we were summoned after almost three months. During the following weeks, attacks on journalists and NGO activists took the form of public spitting by a group of young men. They posted videos of their actions online, in what appeared as an attempt to incite further violence. These incidents stopped abruptly after one of their intended victims, instead of waiting to be spat on, slapped one of the offenders. Media controlled by VMRO-DPMNE published that video too, trying to portray him as aggressor. Meanwhile, because neither state institutions nor protest organizers would guarantee the safety of journalists, several independent media declared that their crews would not cover these events. When in the following weeks some of them started sending reporters again, verbal and physical assaults continued. For instance, on March 10, journalist Hristijan Banevski received a blow on the head with a flag pole. Then, the violence escalated significantly. On April 27, a mob — which allegedly included disguised members of security forces, according to some local journalists’ investigations — attacked the parliament, attempting to lynch legislators from the new parliamentary majority. 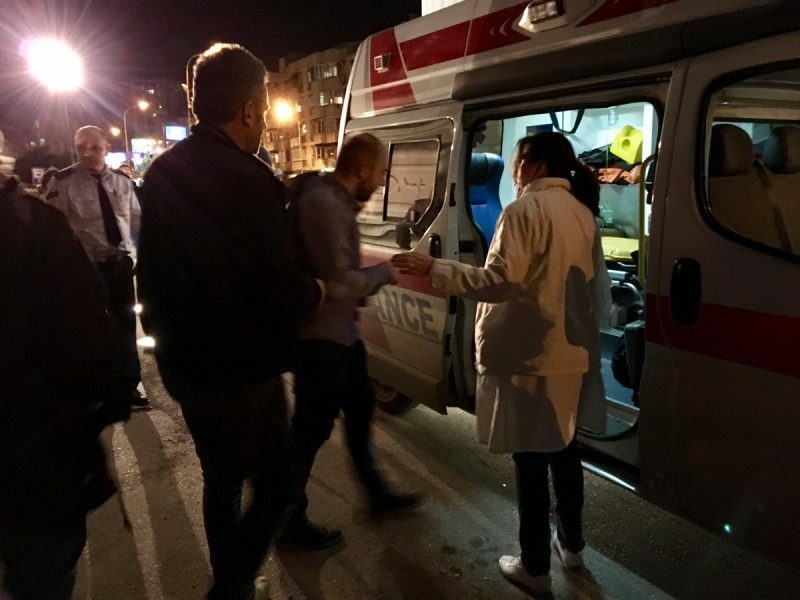 During the several hours while they rampaged through the building, they also targeted journalists from blacklisted media, injuring over 20 people. One journalist directly affected by the violence on “Bloody Thursday” was Dimitar Tanurov. On the evening on April 27, he went to parliament and started taking photos and videos with his mobile phone. At least five members of the mob accosted him, hitting him and trying to grab his phone, while demanding that he stop filming. 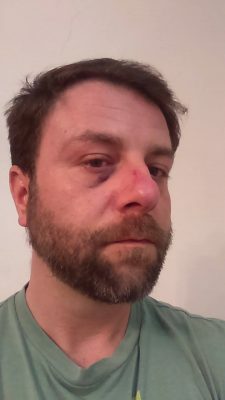 The beating intensified after one of them saw from Tanurov's press card stating that he works for the independent news agency Meta.mk; they called him a “traitor” connected to George Soros. Soros is a liberal billionaire and foundation chair who has been celebrated and criticized for promoting democracy through his organizations. VMRO-DPMNE previously announced the start of “de-Sorosoisation” in Macedonia, a newspeak term meaning a purge of all they designate as enemies. Editors note: Global Voices is a grantee of the Open Society Foundations, which are part of the Soros network. Dimitar Tanurov after the attack. Photo used with his permission. Tanurov managed to exit the building and go to a nearby hospital, where he was diagnosed with a concussion. Tanurov then reported the attack to police. However, Tanurov's case was not filed as a violent assault, but as a mugging due to his phone being taken from him. During the following weeks, while on sick leave to recover from his injuries, he made repeated visits to the police, bringing them new evidence such as photos of identified attackers from videos made during that evening. He had been trying to reclassify the case from theft to violence. Сè уште не можам да закрепнам од тоа што се случи, и еден месец подоцна. Сè уште ги имам кошмарите и сум под терапија. Случајот се води како „разбојништво“ а од обвинителство се уште немам добиено ниту повик за идентификување на напаѓачите ниту да дадам изјава што конкретно се случи вечерта. I still can't recover from what happened, even though a month has passed. I still have nightmares and I'm in therapy. The case is classified as a ‘robbery’, and I still haven't been contacted by the public prosecutor to identify the attackers, nor to give a statement about what actually happened that evening. One of his assailants, identified on the security footage at the parliament, has allegedly fled the country. A judge refused to grant permission to the police to conduct a search of the perpetrator's house. Some of the other affected journalists spoke publicly about their horrifying experiences in the parliament, but very few made official reports to the police because they don't think there will be any consequences.